On another front in Syria's seven-year civil war, Turkish air strikes killed 36 pro-regime fighters in a Kurdish enclave near the Turkish border. Douma, Syria: Government forces seized territory inside Syria's rebel enclave Eastern Ghouta Saturday, intensifying fighting as tens of thousands of civilians in the besieged enclave near Damascus awaited urgently needed aid. On another front in Syria's seven-year civil war, Turkish air strikes killed 36 pro-regime fighters in a Kurdish enclave near Turkey's border. Syria's war has killed more than 340,000 people and spiralled into a complex conflict involving world powers since it started in 2011 with the brutal repression of anti-government protests. Russia-backed regime forces have since February 18 killed more than 640 civilians -- including over 150 children -- in a ferocious bombardment of Eastern Ghouta, one of the armed opposition's last strongholds in the country. 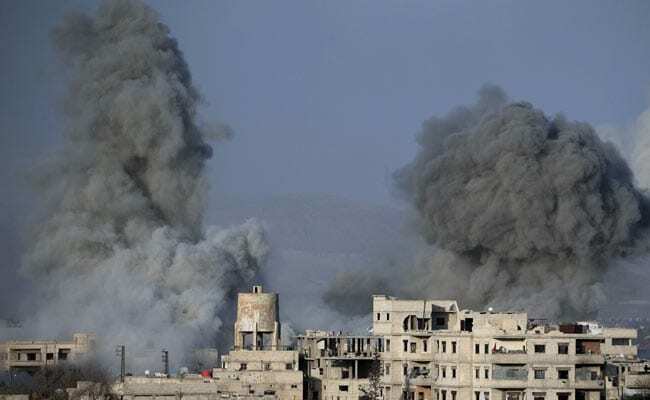 Following a deadly wave of air strikes and shelling, fighting on the ground has intensified in recent days, and the regime now "controls 10 percent of the besieged Eastern Ghouta region", the Syrian Observatory for Human Rights said late Saturday. Regime forces have advanced steadily since Thursday, the Britain-based monitor said earlier, recapturing four areas in the east and southeast of the enclave as well as two air bases. "Regime forces and their allies have intensified their attacks on rebel positions in the past 48 hours," Observatory head Rami Abdel Rahman said. The progress has been rapid through mainly agricultural land, he added. "The terrorists will soon taste defeat in Ghouta," said Syria's Deputy Foreign Minister Ayman Soussan. Eastern Ghouta's 400,000 residents have lived under siege since 2013, facing severe food and medicine shortages even before the latest offensive. The fighting on the ground comes after Russia on Tuesday started a daily five-hour "humanitarian pause" in the enclave -- a move that falls far short of the 30-day ceasefire demanded by the UN Security Council. The ferocity of the bombardment initially lessened but it has continued to claim lives, and trucks loaded with desperately needed aid remain unable to enter the enclave. Thousands of civilians are surviving on meagre stocks, and medical staff are struggling to treat casualties with inadequate medical supplies. French President Emmanuel Macron and UN Secretary-General Antonio Guterres expressed "grave concern" about the humanitarian situation in the area in a telephone conversation late Saturday, according to a statement from the Elysee Palace. "The UN convoys must immediately deliver medical assistance and food aid to the besieged population," the French Presidency said. The UN Human Rights Council postponed voting Friday on a British resolution condemning the crisis in Eastern Ghouta, after member states failed to agree on a final text. Moscow has offered safe passage to non-combatants wishing to leave the enclave during the pause, but no Syrian civilians have left since Tuesday, the Observatory says. The Russian military said in a statement that no civilians exited via the established corridor on Saturday. Government fighters are trying to advance inside Eastern Ghouta to cut off the main town of Douma and its surroundings in the north of the enclave, as well as isolate the southeastern area of Al-Marj, Abdel Rahman said. Jaish al-Islam, a main opposition group in the region, accused regime forces of carrying out a "scorched earth policy" as they progressed into the enclave. In the northwest of the country, there was more bloodshed in the roughly six-week offensive by Turkey and allied fighters against Kurdish militia now backed up by pro-government Syrian forces. Turkish air strikes killed at least 36 pro-regime fighters battling alongside the Kurds in the enclave of Afrin on Saturday, the Observatory said. The Kurdish-led Syrian Democratic Forces (SDF) alliance said the Turkish raids targeted pro-regime positions, but gave no death toll. The two-storey building where the fighters were located was completely eviscerated, an AFP correspondent reported, with several burnt-out vehicles visible among the rubble. The Observatory said the strikes on the area of Kafr Janna were the third such raid on loyalist fighters in the enclave bordering Turkey in less than 48 hours. They came after Turkish raids on other parts of the enclave killed 14 pro-regime fighters on Thursday and four more on Friday, the monitor said. Turkish-led Syrian opposition fighters on January 20 launched an assault on Afrin, controlled by the Kurdish People's Protection Units (YPG). Pro-regime fighters joined the Kurdish militia inside Afrin a month later, after the Kurds appealed to Damascus for help. The Observatory says Turkish-led forces control more than 20 percent of the enclave after seizing the area of Rajo in the northwest of Afrin on Saturday. They also seized a strategic mountain in the northeast of the enclave, a military official from the Turkish-led operation said. Ankara says the YPG is a "terrorist" extension of the Kurdistan Workers' Party (PKK), which has waged a three-decade insurgency against the Turkish state. The YPG has been a key component of the US-backed SDF, a Kurdish-Arab alliance that has been fighting the Islamic State jihadist group in Syria. The Observatory says more than 140 civilians have been killed in Turkish bombardment since the start of the assault, but Turkey denies the claim and says it takes the "utmost care" to avoid civilian casualties. Thousands of civilians have fled their homes since the start of the operation, either to Afrin or to nearby regime-controlled areas.